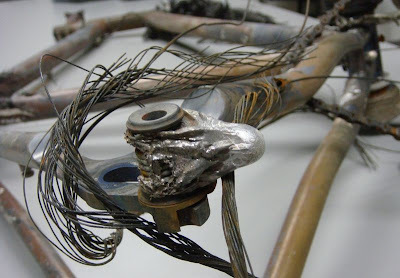 Ron George: Can A Titanium Frame Be Reused After Fire Abuse? 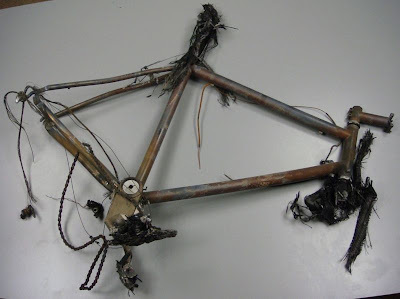 Can A Titanium Frame Be Reused After Fire Abuse? Can we answer such a question with certainty? I don't know. What I can tell you is that it will slightly be more involved than just a shake of the head. Lets make a try. Here's the frame post fire. Notice the bent seat stays. Take a look at the surface of this frame. There are tints of blue, purple, red and gold colors as evidenced by Seven's Rob Vandermark. Certainly this baby has gone through some serious fire abuse. Rob thinks that it almost looks as if its anodized. According to his blog, the fire Marshall who took care of the situation placed the peak temperature of the fire in excess of 2000 deg F.
The tubing of the frame is made of Ti-3AL-2.5V alloy generally used in cold-worked, stress relieved condition. It has high strength to weight ratio and is lighter than stainless steel. I'm certainly not a materials expert so consulting the "Materials Properties Handbook" by Welsch, I have found the tensile properties of the tubing alloy at room temperature, and at a few higher temperatures. Click to zoom in, and view. Another table from the same book shows typical heat treatment temperatures for Ti. We find the peak house fire temperatures (>2000 deg F) could have likely exceeded annealing and solution heating temperatures for this alloy. Lets keep these numbers in mind as we move forward. This particular Ti alloy has 3 wt% of Aluminum as Alpha Stabilizer and 2.5 wt% Vanadium as Beta Stabilizer. The transformation temperature from Alpha-Beta or from Alpha to all Beta is known as Beta Transus Temperature (BTT). Below the BTT, the Ti would be a mixture of Alpha-Beta if it has beta stabilizers. So for example, the BTT for aerospace grade Ti-6AL-4V is shown below. The BTT is very important because processing and heat treatment are often carried out with reference to some incremental temperature above and below the beta transus. Without going into unnecessary detail into these things, what is to be remembered is that the alloying elements used help fulfil a particular microstructure of the alloy by raising (Aluminum) or lowering (Vanadium) the BTT. 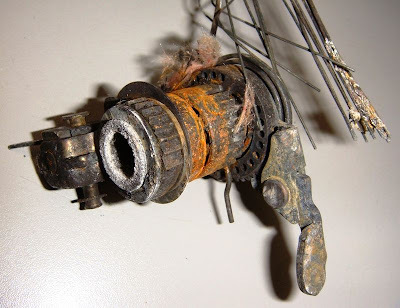 The BTT for Ti-3AL-2.5V is 1715 plus or minus 25 degree F.
Clue to fiery temperature : The Aluminum from the rear triangle is toast, and since Al melts at 1200 degrees, this fire was apparently exceeding those temperatures. The peak temperature estimate of 2000 deg F fire marshall is pretty close to the BTT for this alloy, and hence a phase transformation. What we don't know for certain is whether it slowly burned, what contaminents from the burning materials around it mixed with it (example, carbon from wood), and whether it was cooled suddenly by the water from the firemen or took a more gradual cooling curve. What I'm essentially trying to say here is that the BTT, and the heating and cooling curves with time definitely dictate the changes in this tubing's microstructure transformation. Here's the transformation temperatures and phase structures for Ti 3AL-2.5V. Notice the BTT line at around 1715 deg F and how the phase changes. Since I'm not a materials expert, I'm not going to definitely put an answer as to whether this frame can be reused or not. But as I have shown here, theoretically, temperatures that the frame could have encountered in the house fire would have likely begun to transform its microstructure in some fashion. It would be best to have the frame sent to Materials Testing Lab for non-destructive testing for hardness or a more involved etching process to observe the microstructure. If you ask me, I WOULD not ride this frame, especially in a performance demanding scenario such as a bicycle race, just because I believe its strength has been compromised due to heat abuse. Certainly, while it may look good on the outside, the material properties from the inside could have likely changed from those at room temperature. The intense heat of the fire MAY have trapped some residual stresses in the frame as well. Overall, how such treatment has affected riding performance can be observed through actual use. Certainly, you must give it to Titanium for handling such an abuse. I would hang this frame up for eons on my wall. It will be the one trophy that will stand out from an unpleasant memory. Christ! I can't imagine what'd happen if instead of titanium, it was magnesium. How much more dangerous would the fire have been with that stuff around? I sure hope one of those things doesn't burn up while I'm on it! Quite amazing what the fire has done. I'm intrigued with the effect on the carbon components. 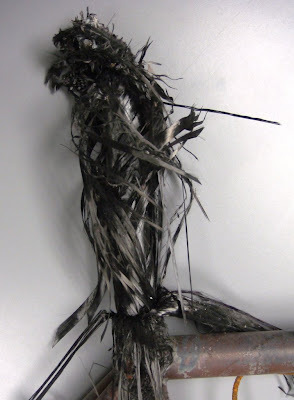 Seems the carbon has had the resin totally removed taking the fibres back to their fabric state. If so, seems a rather simple, cost effective method of recycling. Although, a little limited on fibre length...just a thought.